Stars generator allows for creating a starry night sky, with stars drawn fast on Billboards. It is found on Billboards node → Stars tab. On the Billboards tab of the Parameters window, go to the Stars section and specify a FK5 stars catalog (the Fifth Fundamental Catalogue) in the Catalog field. Make sure that the Radius of the created sphere with stars is not bigger than the camera's far clipping plane (Camera Settings → Far clipping). Otherwise, stars will not be seen. Click Generate button to create billboards. Click Texture button and choose a location to save a texture atlas with stars. Inherit a material from billboards_base_stars and assign it to ObjectBillboards. 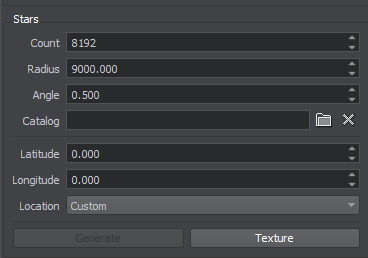 Go to Textures tab of the Parameters window and load a diffuse texture: select the previously saved stars texture. After changing any parameter in the star generator, click Generate to reload the diffuse texture. The maximum number of billboards to create. If there are fewer stars in the loaded catalog, fewer billboards will be created. Radius of the sphere with stars billboards. 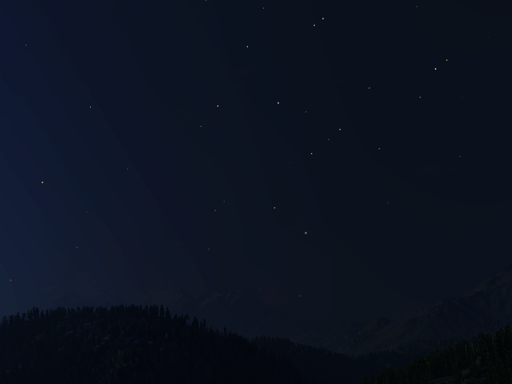 To see the stars, the Radius should be smaller than the camera's far clipping plane (Camera settings → Far clipping). For big worlds, stars Billboards also needs to be attached the camera (made a child node of the player) to avoid any clipping. The higher the value, the bigger the stars. Load a FK5 stars catalog. Latitude of the point to view the star sky from. Longitude of the point to view the star sky from. Choose a city to view the star sky from. Generate stars billboards and reload the diffuse texture, if it is set in the Material settings. Save an atlas texture for stars billboards based on the loaded catalog.